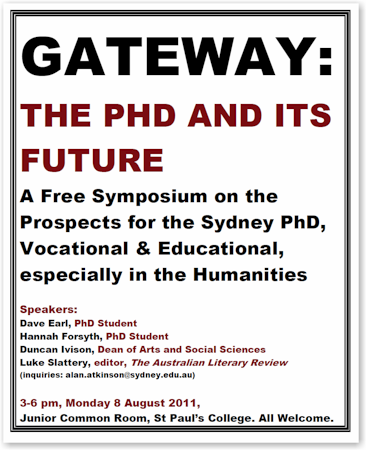 Paper presented to Gateway: the PhD and its Future, St. Paul’s College, Sydney University, Monday the 8th of August. The past few years have been a time in which the university, and the higher education sector more broadly, has been reflecting very deeply on the role of the PhD in today’s society. We’ve had a working party review the PhD process, we’ve had the University White and Green Papers, we’ve seen the Bradley Review, and the reports of parliamentary standing committees into Research Training in Australia (Bradley et al. 2008; Standing Committee on Industry 2008; Sydney University PhD Review Working Party 2009; The University of Sydney 2010, 2011). Today I’d like to think in a more practical manner about what the university could do to re-enforce what I believe to already be an outstanding humanities research environment. I’ll apologize now for what might come across as talk which promotes the impression that PhD candidates have a boring predilection for practical and financial matters. I get the impression that Alan was hoping for a more abstract discussion of lofty ideals. However, at the end of the day, practical and financial matters are the foundations upon which we learn. Without money, and without a place to work, it’s hard to put our minds towards the kind of higher learning, and higher thinking, that our University demands. The most brilliant candidate cannot complete a thesis if there’s no food on their table, or worse, they’ve no table to put the theoretical food upon. By and large, the university is tracking well in terms of research experience. Student Research Experience Questionnaires from last year indicated that over 80% of candidates in the Faculty were satisfied with their supervision (2010, Q36). Almost 85% of students agreed that their supervisors were there when they needed them (SREQ 2010, Q1). A similar number of students agreed that their supervisors made a real effort to understand their difficulties, and provided useful feedback on their progress (SREQ 2010, Q5, Q21). This is an outstanding result and attests to the quality of the academics within the Faculty of Arts. Students generally feel integrated into the faculty and its departments. Studies have shown that PhD candidates are happiest when they feel that academic staff treat them as junior colleagues, rather than grist for the funding mill (Conrad 2003). This is the spirit which we are fostering at Sydney. I feel the History Department is a model of how a Department should be run. And, over the past few years, during our candidature, we’ve seen material improvements in the manner in which the PhD process in managed. Seminar series, coupled with public lecture programmes, have been established, postgraduate representatives have been appointed to the department, and we now have a dynamic and pro-active postgraduate co-ordinator. These kinds of arrangements should be formalised and rolled out across the faculty. Ultimately, the humanities PhD is aimed at training researchers. It is an apprenticeship to academia. And we are very lucky in this regard. We have some of the best humanities researchers in the world. Without doubt, our history Department is the most formidable in Australia, which rightly gives us a sense of great pride. Other history departments are hiring Sydney graduates. Agnieszka Sobocinska, Tony Moore, Melissa Bellanta, Amanda Kaldelfos, Julie McIntyre, are just a few of our former students who have made successful transitions to early career researchers. But, realistically, these outstanding graduates reflect only a fraction of the people who have passed through our doors. The 2008 Report on Building Australia’s Research Capacity noted that we can expect a shortfall of academics to emerge in coming years. But this will be concentrated in fields such as Geology, Mathematics, and Engineering (Group of Eight 2008, 4). 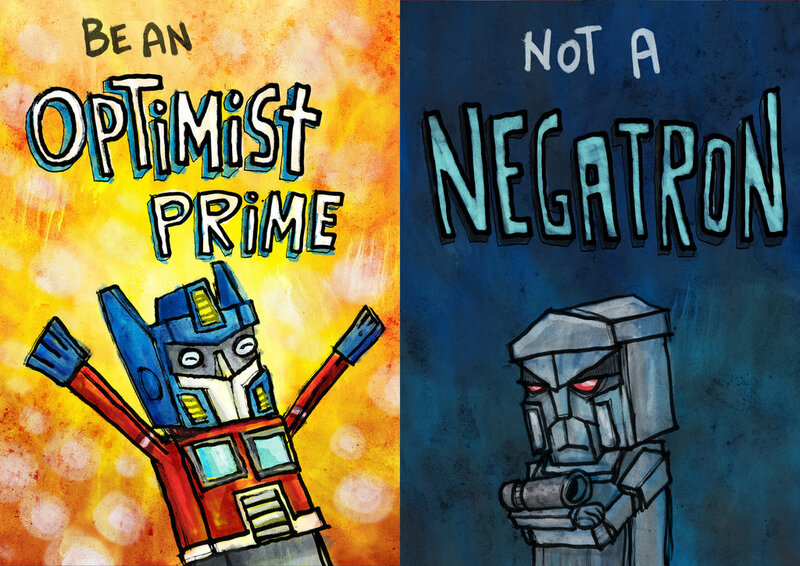 In the humanities we are in a paradoxical position. Jobs, and particularly tenure track positions in academia, are falling, but the number of graduate enrolments, encouraged by the Federal Government, continues to grow. Humanities PhDs generally compete [for jobs] at a moderate disadvantage against undergraduates, and at a serious disadvantage against people with professional degrees (Benton 2009). Research in Australia by the Group of Eight unfortunately supports his findings. In 2006, the median income earned by people holding higher research degrees was lower than the median salary of individuals holding a Masters by coursework (Cited in Standing Committee on Industry 2008, 88). Until recent years, humanities graduates might be expected to find work in a museum, a library or gallery, or perhaps in the publishing industry. But all these fields have developed specialist postgraduate degrees. To work in a museum, for instance, a graduate with a doctorate in the humanities often has to cap their training with a graduate diploma or a masters in museology. Many of us, I believe, will have to face the real world, a world of graduate positions in corporations and government departments that are often hostile to the way in which academics think, to ways in which we interact, and possibly even the way that we dress. One panacea, already suggested by our working party into the PhD, is the formalisation and codification of developing generic graduate attributes (Sydney University PhD Review Working Party 2009, 1). This is clearly very important, and we all hope that Sydney turns out graduates who can speak in public, analyse key issues, and work in a team. But ultimately, there are real limitations to the generic skills model. This is because the generic skills developed by students studying say history, literature, or fine arts, for instance, are skills expected to be developed by all PhD candidates, regardless of discipline. Ultimately, who is more employable: a critical and flexible thinker, with sound research skills and a detailed knowledge of government, or a critical and flexible thinker, with sound research skills and a detailed knowledge of medieval Italian art? Above anything, the most important part of doing a PhD is actually completing it. As I’ve often joked with my supervisor, the only thing more useless than a PhD in history is a half-finished PhD in history. If any of our capable candidates do not complete their degrees, then it is a personal disaster for them, and a financial disaster for the University. A study undertaken across six universities, published in 2004, found that humanities had an average completion rate of 47% after 5 years of candidature . Of the remainder 41% had withdrawn, and 12% were continuing (Bourke et al. 2004, 6). I’m not privy to specific figures for Sydney, and I presume that our completion rates are higher. But still, we need to do all that we can to help our candidates submit their theses. And, ideally, we want them to submit very good theses. We need more qualitative data on why students withdraw from their degrees. But from the ground, it seems that it is often practical considerations, some of which Hannah has touched upon, which wear candidates down and force withdrawals. How do we reduce this? First up, potential candidates need to be given frank evidence and advice about funding before they are enrolled. The university needs to find the correct balance between attracting candidates, and providing transparent, publicly available statistics. Too many candidates are enrolled without funding, or into M.Phil. programmes, with vague promises of future upgrades. “Enrol now and you might receive an APA from your second year, if you publish,” has to stop. If an individual is to commit four years of their life, and many thousands of dollars, potentially sacrifice personal relationships, and so forth, we owe it to them to give them the odds. How many students actually receive an APA in the years after initial enrolment? How many students successfully upgrade from an MPhil to a PhD? What is the overall attrition rate in the faculty, in the school, and for individual supervisors? Related to this problem is the allocation of casual tutoring positions. Again, many candidates enrol having received promises of regular teaching positions which often don’t materialise. At the moment, tutoring is distributed by lecturers as if it is their personal fiefdom. Students whose supervisors teach regularly find income, those whose supervisors don’t receive little work. A supervisor receiving an ARC grant, and a two year reprieve from teaching duties, can be a financial disaster for their students. It is disheartening, to say the least, to see people in their thirties and forties, who have withdrawn from professional careers to engage in research, reduced to waiting tables at night to eat. It can’t continue like this. Either tutoring needs to be allocated equally amongst students, on some sort of quota basis, or it needs to be tendered competitively and transparently. The faculty’s labyrinthine administrative arrangements need to be further streamlined. We have been tracking well in this regard, but more could still be done. Funding and grant applications need to be further formalised and coordinated. Similarly, faculty administration and research office funding need to be better co-ordinated. Particularly, the issue of personal and sick leave needs to be appropriately managed. Chronic illness, and other disabling conditions, can be a major factor in non-completion. The only option for candidates with severe or long-term illnesses is suspension from candidature, which leaves students with little support from the University, and no money. Finally, as Hannah has noted, we need desks. Real desks with shelves on them for books. When 25 per cent. of respondents disagree or strongly disagree with “I have access to a suitable working space,” and a further 25 are neutral, we have a real problem (SREQ 2010, Q2). We’re slowly getting there: ten years ago 37% per cent of students disagreed with that statement (SREQ 2002, Q2). But compare our responses to the Sciences, where over 80% of candidates agree that they are given good access to computer facilities, and 75% feel that there is appropriate financial support for research activities (SREQ 2010, Q2, Q28). Universities Australia, in their most recent budget submission, argued that the RTS underfunds doctoral research across Australia to the tune of $270 million (Universities Australia 2010, 18). However, humanities candidates feel that they are not receiving their share. Almost 39% of students disagree or strongly disagree that there is adequate financial support for research activities (SREQ 2010, Q28). I have only anecdotal evidence to support this, but we are aware, for example, that some doctoral researches in other faculties have access to things as exotic as research assistants. At the end of the day, we ask ourselves, where has the funding gone? A back of the envelope calculation, taking into consideration supervision time, a weekly seminar, library access, and the chance of a hot-desk does not add up to near thirty-thousand per annum. These are not additional expenses. At the moment, we gamble on the completion of candidates. An investment in facilities and funding reduces the odds of non-completion significantly. Sydney University will get a sound return on these investments. And I’m hoping here, that I have not sounded too cynical. On balance, the Faculty is tracking well, and we have the plans in place to do better. Let’s see if we keep to our promises. The Standing Committee into Research calculated the cost of undertaking a PhD on a APA scholarship with no tuition fees in the following manner : the loss of four income generating years, even on a graduate salary of 55,000, results in a net cost of 140,000 dollars over the course of the PhD. If we take an employer superannuation contribution of 9% on top of that, and compound it at a modest rate for 20 years, we have a further cost of over 35,000 (Standing Committee on Industry 2008, 88). The University has to carry the cost of HDR students from enrolment until two years after they submit – the government doesn’t pay RTS funding until the year following the one in which completion is notified. This is commonly 5 years after the enrolment of a full-time PhD and 10 years after the enrolment of a part-time PhD. The GSO estimates that for every $1 the government pays the Uni for an HDR student, it spends about $1.40 – and it’s up to ten years before they get it reimbursed. Other GO8s have estimated between $1.30 and $1.50 for each $1 they receive, so Sydney is about right. Low-research institutions may only be able to spend $1 for each $1 they receive – be glad you’re not enrolled at one of those. The financing of and return from PhDs is a tangled and complex story, and it’s further complicated by the lack of knowledge of how much research is actually done by PhD students – some estimates are 65% (which seems like a lot to me). Until very recently, no figures were kept on what percentage of reported publications could be attributed to us either. Interesting stuff – but then I would say that! I’m doing a PhD on the process of doing a PhD (at Sydney). Just read this – hadn’t had a chance before. It’s a terrific paper and I hope Duncan reads it and thinks it through. I particularly like the case you make for transparency – for me that’s the key. I understand that there isn’t enough money but it’s not good enough to simply assert this – I want to see it written down. The comment from M-H is also very interesting – I had no idea that we cost more than the government funding.